Why Apprenticeship? That’s an easy one. We need highly educated technicians to maintain and repair the vehicles of today and tomorrow. Apprenticeship is a tool that helps us do just that. The Automotive repair industry needs new blood to fill in the gaps from an aging labor force that is starting to retire. 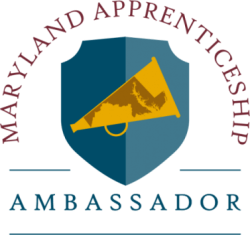 We have partnered with the State of Maryland to create our apprenticeship programs that run consecutively, laying out a career path from day one. A big problem for us was getting young minds and their parents interested in the automotive field. It’s a stereotype that this is a dirty industry and you cannot make a good living doing this. Nothing could be further from the truth. There are more lines of computer code in today’s car then in the F35 strike fighter, a lot more. The most advanced military aircraft has 35 million lines of code. Today’s new vehicles have three times that. You need continuing education to be able to repair and diagnose these complex systems. These Apprenticeship programs help to do just that. We have implemented both the Youth and Registered Apprenticeship programs to create a clear career path for our apprentices. We wanted a path that can start in High School and transfer into college/mentorship and continues to build year after year with their education. A student can start with us in the Youth Program during their junior or senior years of high school. This program allows them to earn credit for school while working and learning with us. “Earn while you learn.” We have a guided path laid out to give experience and knowledge to the apprentice while working. It’s a great way to see if this industry is for you. Our Registered Program is much more in-depth and structured to promote growth and learning in an automotive career. We have a three-year plan that is a real career path that lays out which colleges classes they will attend, hours they will work and even when and how much their compensation will be out in front of them. After completion, the learning never stops. The plan is to place the apprentice in one of our multiple locations, working alongside our team of experienced ASE Certified Technicians. It’s a great environment and culture to develop into a top-tier technician. Training will continue indefinitely in this profession. Vehicles change every day, and we need to stay at the cutting edge of that technology. Apprenticeship is not designed to create a job….Its intended to foster a career. Our Youth Apprenticeship Program is the door for someone that is considering a career in the Automotive Repair and Service industry. 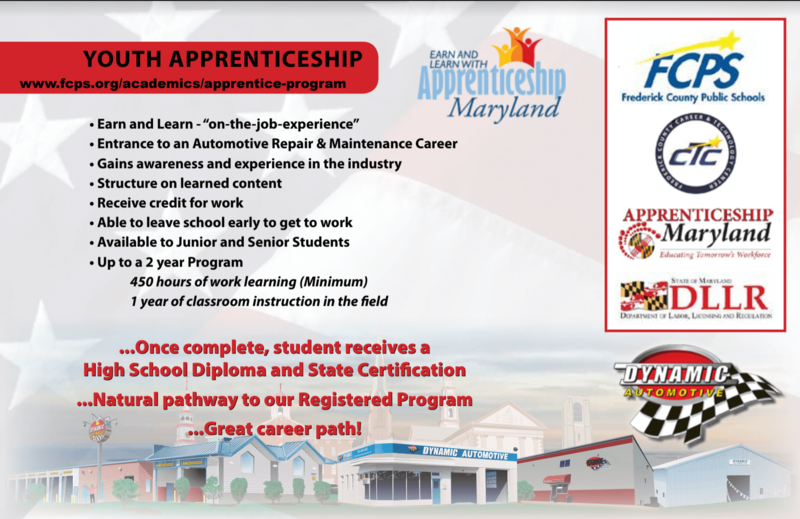 We have partnered with the State of Maryland DLLR, Frederick County Public Schools, Career & Technology Center by enrolling in the Youth Program to bring students still in high school wanting some direction and a pathway to a career in the automotive industry. The Youth Apprenticeship Program allows you to earn while you learn. You are allowed to work as a part of your required school credit, and you get paid for it. This is an excellent program for someone who’s looking to gain experience and awareness in this industry. This program lasts up to 2 years, requiring a minimum of 450 hours and one year of classroom instruction. We have an outlined training plan that lets the apprentice understand what will be expected from them, what they will be required to learn and what they should be able to do once they have completed the program. They will work with other technicians and mentors to give them hands-on experience and advice to help them in the learning process. Once completed the student receives a state certificate along with their high school diploma. Our Registered Program is much more in-depth and structured to promote growth and learning in an automotive career. This is where things get serious. If you’re out of high school, you could jump in right here if you know being a technician is the career for you or entering into this program is a natural pathway from the Youth program. The Registered program combines supervised, structured, on-the-job training and related technical instruction to teach apprentices the skills necessary to succeed in the Automotive Repair Industry. We can do this because we have partnered with Maryland DLLR, Montgomery College and Catonsville Community Colleges. The apprentice works full time and is registered with the state of Maryland. Our program complies with both federal and state regulations. Minimum pay structures are laid out with timelines and amounts of compensation throughout the program. Our program is three years in length; the apprentice must work a minimum of 2000 hours a year, with a minimum of 144 hours of classroom instruction. We offer dual enrollment allowing the apprentice to pick between Montgomery College and Catonsville Community College for their college instruction. These courses are for credit that can go towards a degree in the future. This program is the career pathway for people that want to know how much compensation they will receive, when they will get their raises and how much, know what classes they will be taking and how long it all lasts. So what does the apprentice gain from this program? Once completed, they will have received multiple certificates from their chosen college in different vehicle systems. They will have spent the last three years with a mentor, learning the ins and outs of repairing and diagnosing vehicles. They also receive a certificate of completion from the state of Maryland and should be well prepared to enter the automotive industry as a solid, well educated, certified, prepared technician. Apprenticeship is not designed to create a job….Its intended to foster a career.